Learning Spanish? Visiting South Florida soon? Add spice to your learning and have fun with Cuban Spanish Phrases and Lessons! While this app is geared for beginners, it will certainly help intermediates wanting to supplement their knowledge with the Cuban Spanish dialect. This is a Universal app which means you buy it once and can enjoy learning on your iPod Touch, iPhone, and iPad for no extra charge. Learn over 600 useful phrases recorded in crystal clear audio by a native Cuban Spanish speaker in Florida. * Enjoy eight lessons (with more coming) on the language and culture. Most examples in the lessons play the phrase when tapped. * Learn words and phrases with Flashcards (flip to see the English) or Study Cards (shows everything on one card). * Most entries have grammatical or cultural notes. * Learn smarter with helpful statistics and ranking encourage regular studying (track how long you’ve studied, what you last studied, review familiar but not mastered phrases, etc). * Take the quiz to test what you’ve studied. * Add any word or phrase to your Study Bank to review later. * Email one or all of the items in your Study Bank. * The settings screen allows you to personalize your learning experience. * Other features include: Search the Spanish and English; random card; Auto flip to automatically go from card to card (the time is set in the settings). ENGLISH + SPANISH + JAPANESE = Language learning fun! 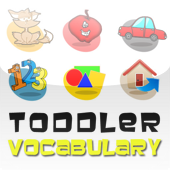 Over 150 vocabulary words hand picked for your toddler–each with an English, Spanish, and Japanese sound file. Your toddler won’t just see a pretty picture, but he or she will hear it in English, Spanish, Japanese, all languages, or none at all! Your child chooses from one of six picture and color coded categories. The first flashcard appears and automatically speaks the word in the language you choose (default is English). We designed this to be as simple and intuitive as possible. Hand it to your toddler (may want to put your iPhone on Airplane mode!) and let Toddler Vocabulary entertain (and teach) while you read that new summer novel. 1) Auto play the word in English, Spanish, or Japanese. 2) Have all three languages play automatically or none at all (silent mode). 3) Choose to have the words in each category display Randomly (default) or Alphabetical (numbers go from 1-25 when set “Alphabetical”). 4) Your settings are saved when the app closes.